We have recently published a review article titled “Fatigue of Hydrogels” in European Journal of Mechanics / A Solids. This article is the first review on the fatigue of hydrogels. Hydrogels have been developed since the 1960s  for applications in personal care, medicine, and engineering. Evidence has accumulated that hydrogels under prolonged loads suffer fatigue. Symptoms include change in properties, as well as nucleation and growth of cracks. In this Journal Club, I would like to share with you this exciting field at the interface of physics, chemistry and mechanics. Fatigue of hydrogels is an interplay of chemistries of bonds, topologies of connection, and mechanics of dissipation. Discussions here will be focused on an outlined understanding we have recently gained on the topic. For more details, see the full version of the review. The motivation to study the fatigue of hydrogels is two-fold. From the perspective of application, as the property space spans and applications proliferate, hydrogels—like all materials—will be used under conditions that push their limits. Many applications require hydrogels to sustain prolonged static and cyclic loads. Fatigue of hydrogels is recent and scanty. The first report on crack growth in a hydrogel under prolonged static load was reported by Tanaka et al. in 2000 . The first report on crack growth in a hydrogel under prolonged cyclic loads has only appeared recently by Tang et al. in 2017 . From the perspective of fundamental study, all symptoms of fatigue originate from one fundamental cause: molecular units of a hydrogel change neighbors under prolonged loads. Fatigue is a molecular disease, and correlates with rheology. As a result, fatigue is a lens to view molecular processes. Because of the molecular diversity in hydrogels, the chemistry of fatigue holds the key to the discovery of hydrogels of properties previously unimagined. Historically, the word fatigue has been used to describe many symptoms observed in materials under prolonged loads (in mechanics fatigue mostly refers to failure under cyclic loads). Two idealized profiles of loads are commonly used to characterize fatigue: static loads and cyclic loads. We call fatigue under prolonged static loads static fatigue, and fatigue under prolonged cyclic loads cyclic fatigue. In a real experiment, a load is either prescribed by stretch or stress. Fatigue may refer to the degradation of properties (e.g., modulus, toughness, conductivity, and swelling ratio). We call distributed damage under prolonged loads fatigue damage. Fatigue may also refer to the nucleation and growth of cracks in hydrogels. The nucleation of cracks is commonly studied using samples with no precut cracks, whereas the growth of cracks is commonly studied using samples with precut cracks. We call fracture under prolonged loads fatigue fracture. We call crack growth under prolonged loads fatigue crack growth. The speed of the crack under static loads (or crack growth per cycle under cyclic loads) is a function of the energy release rate. A hydrogel under fatigue crack growth (either static or cyclic) exhibits a threshold and a toughness (fracture energy). The crack does not grow when the energy release rate is below the threshold, and grows rapidly when the energy release approaches the toughness. Fig. 1. Symptoms of fatigue. (a) Fatigue studied using samples with no precut crack. (b) Fatigue studied using samples with precut crack. The load is prescribed by stretch here. Symptoms of fatigue vary with chemistries of bonds and topologies of connection. Representative bonds and complexes in hydrogels include covalent bonds (static or dynamic), ionic bonds, hydrogen bonds, hydrophobic interaction, dipole-dipole interaction, pai-pai stacking, and host-guest interaction. Irreversible bonds can be relatively strong, but do not reform after breaking despite extreme conditions (e.g., C-C bonds). Reversible bonds are typically weak, and may reform after breaking (e.g., some ionic bonds). By a topology of connection we mean an arrangement of bonds of various types to link monomer units into polymer chains, and crosslink the polymer chains into polymer networks. The difference in the topologies of connection causes difference in the symptoms of fatigue.Under a monotonic load, a double-network hydrogel resists the growth of a crack by dissipating energy through two mechanisms: scission of primary polymer networks on the plane of the crack, and breaking of sacrificial bonds in the bulk of the hydrogel. The sacrificial bonds act as a toughener. Representative topologies of connection are presented in Fig. 2. Fig. 2. Representative topologies of connection in hydrogels. In a hydrogel or an elastomer, a crack typically grows when large deformation prevails in the main part of the body, where nonlinear elasticity applies. For elastomers, the use of samples with precut cracks was initiated by Rivlin and Thomas  to study crack growth under monotonic loads, by Thomas  to study crack growth under prolonged cyclic loads, and by Greensmith and Thomas*  to study crack growth under prolonged static loads. The latter two papers, which initiated the study of cyclic and static fatigue crack growth in elastomers, predate the corresponding literature on metals. Also see recent reviews on fracture and adhesion of soft materials , measurement and interpretation of toughness of hydrogels , and crack-front fields in materials modeled with specific Helmholtz functions . 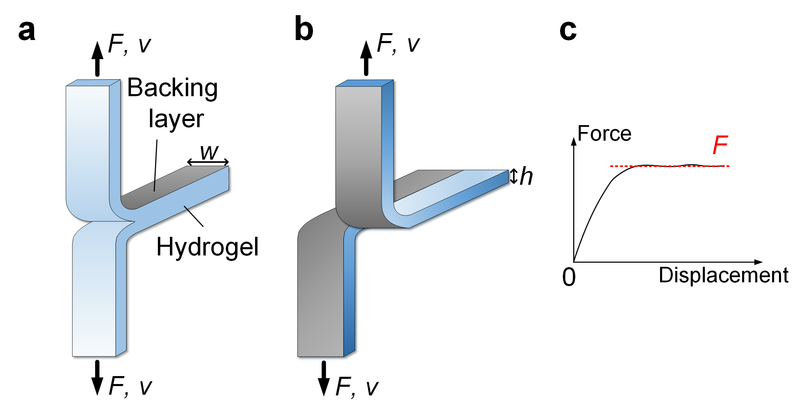 Large-scale inelasticity and complex rheology prevail when the major portion of a sample undergoes inelastic deformation, such as a tough hydrogel. While the energy release rate may be rigorously defined in theoretical calculation, it is usually not well defined or related to the external measuring parameters in experiments. Here we highlight three experimental setups, where energy release rate can be readily obtained for materials of any type of rheology: pure shear, tear, and peel. In a pure shear test (Fig. 3), the energy release rate in a precut sample is G = HW(lambda), where H is the height of the sample in the undeformed state. For an elastic hydrogel, W(lambda) is the elastic energy density of the uncut sample. For a hydrogel of complex rheology subject to static fatigue crack growth, the sample needs to be held at a fixed stretch for a long enough time. The extension of the crack reaches a steady state of constant speed. W(lambda) is the area under the stress-stretch curve of a sample without precut crack, measured at a low enough loading rate to allow stress relaxation. The v-G curve is measured by conducting experiments at different applied stretch lambda. For a hydrogel of complex rheology subject to cyclic fatigue crack growth, W(lambda) is the area of the stress-stretch curve of an uncut sample in the steady state after many loading cycles . Fig. 3. Pure shear. (a) A sample without a precut crack is used to measure the stress-stretch curve and the energy density as a function of stretch, W(lambda). (b) A sample with a precut crack is used to measure the critical stretch for fracture, lambda_cr. In peel (Fig. 4a) or tear (Fig. 4b), the sample is often attached with two inextensible backing layers, which suppress the deformation far away from the crack front. Upon loading, the crack may grow into a steady state, and the force may reach a plateau (Fig. 4c). In the steady state, the energy release rate is G = 2F/w for peel, and G = 2F/h for tear, where w is the width and h is the thickness of the sample. Fig. 4. (a) Peel. (b) Tear. (c) Force-displacement curve. Because the thickness of the sample can be readily adjusted over a large range in peel and tear, peel and tear can be used to probe the scale of inelasticity . The measured toughness is a function of the thickness of the sample (Fig. 5), determined by small-scale or large-scale inelasticity (Fig. 5). Fig. 5. The measured toughness is thickness-dependent under the condition of large-scale inelasticity, but is thickness-independent under the condition of small-scale inelasticity . Peel and tear have some advantages in studying static fatigue crack growth in hydrogels of complex rheology. Because the backing layers limit the active deformation around the crack front, the expression of energy release rate holds at any crack speed, and is independent of the rheology. Cyclic fatigue crack growth has been characterized by tear  and peel  in elastomers, but has not been characterized by tear or peel in any hydrogel. Lake and Thomas noted that the experimentally determined cyclic-fatigue threshold of several elastomers is G0 = 50 J/m^2 . They hypothesized that this threshold is entirely due to the scission of the polymer chains lying across the crack plane (Fig. 6). They further hypothesized that just before scission every covalent bond along a polymer chain is stretched close to the covalent energy of the bond, and the scission causes the chain to dissipate the energy of the entire chain. Fig. 6. The Lake-Thomas model. The thresholds for static and cyclic fatigue crack growth are often called the intrinsic toughness. The notion of intrinsic toughness is used in studying tough hydrogels [7, 8, 14-16]. In the literature, it has been unclear whether the two thresholds measured under static and cyclic loads are identical and corresponding to a single material constant. As described next, our own experimental data indicate the two thresholds can differ greatly. The Lake-Thomas threshold qualitatively predicts the cyclic-fatigue threshold of hydrogels. For example, for polyacrylamide hydrogels, the experimental data and theoretical prediction of the cyclic-fatigue threshold agree well for hydrogels with higher water content, but deviate for hydrogels with low water content  (Fig. 7). Cyclic-fatigue thresholds have also been measured for a few other hydrogels [3, 10, 18-20]. The measured cyclic-fatigue thresholds in all these hydrogels are close to the estimated values using the Lake-Thomas threshold. In all cases, the cyclic-fatigue threshold is much smaller than the toughness of the hydrogel, by one or two orders of magnitude. Fig. 7. 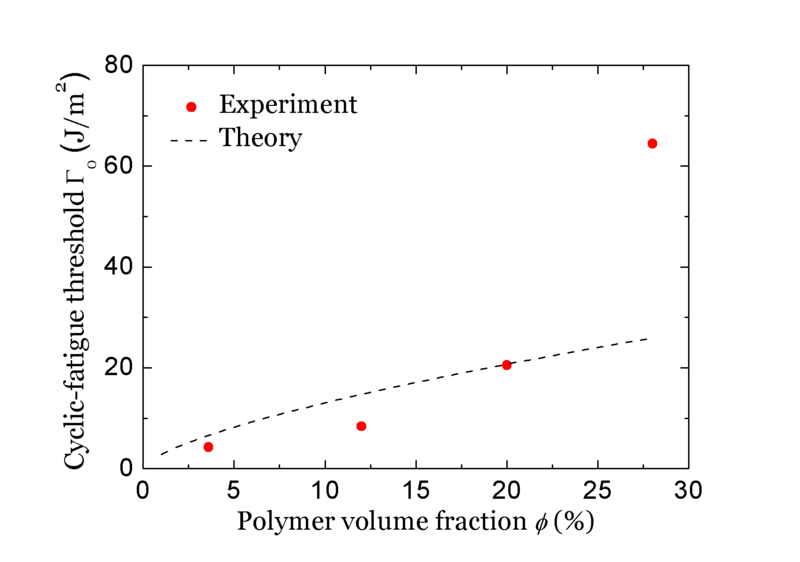 The cyclic-fatigue threshold of polyacrylamide hydrogels with different water content (represented by the polymer volume fraction) . A hypothesis has emerged recently that tougheners increase the toughness of a hydrogel greatly, but contribute little to the cyclic-fatigue threshold . Cyclic fatigue crack growth has been studied in hydrogels of two kinds, identical in all aspects except for tougheners. By doing so, we have ascertained this hypothesis in the polyacrylamide-polyvinyl alcohol hydrogel (Fig. 8a ) and the polyacrylamide-Ca-alginate hydrogel (Fig. 8b ). Fig. 8. The cyclic-fatigue threshold negligibly depends on tougheners. (a) polyacrylamide-polyvinyl alcohol . (b) polyacrylamide-Ca-alginate . While tougheners contribute little to the cyclic-fatigue threshold, experiments show that they can contribute greatly to the static-fatigue threshold . To explain this observation, we find a useful way to classify tougheners. Under a constant stretch for a long time, a toughener that relaxes to zero stress is called liquid-like, whereas a toughener that relaxes to a nonzero stress is called solid-like. We hypothesize that a liquid-like toughener does not contribute to the static-fatigue threshold, while a solid-like toughener contributes to the static-fatigue threshold through the rate-independent dissipation around the crack front. To test this hypothesis, we measured static-fatigue thresholds in polyacrylamide-Ca-alginate hydrogels identical in all aspects except for the concentration of calcium (Fig. 9a). The measured thresholds for different compositions differ by orders of magnitude. Furthermore, even for samples of the same composition, when the size of the inelastic zone is comparable or larger than the sample size at the threshold, large-scale inelasticity takes place, and the measured static-fatigue threshold depends on the sample size (Fig. 9b). The difference between the cyclic-fatigue threshold and static-fatigue threshold of a hydrogel with solid-like tougheners is reminiscent of the fatigue of rate-independent ductile metals, where the cyclic-fatigue threshold is much smaller than the toughness – in this case the static-fatigue threshold – of a ductile metal. Such difference, however, is not distinguished in the study of elastomers. Fatigue correlates with rheology, according to which we distinguish poroelastic fatigue, viscoelastic fatigue, and elastic-plastic fatigue. By poroelastic fatigue we mean the fatigue in a hydrogel due to the time-dependent migration of water. Wang and Hong (2012) initiated the poroelastic theory of cracks in hydrogels . We propose a material-specific poroelastic relaxation speed for crack growth in poroelastic gels, D/(G0/Wf), where D is the effective diffusivity of solvent, G0 is the static-fatigue threshold, and Wf is the work of fracture tested at low loading rate (i.e., the area under the stress-stretch curve measured from a sample with no precut crack, under a loading rate low enough to allow equilibrium). The ratio G0/Wf defines a flaw-sensitivity length for samples tested at a low loading rate . When the crack speed is small compared to this relaxation speed, the energy release rate approaches the static-fatigue threshold. When the crack speed is large compared to the relaxation speed, the energy release rate significantly exceeds the threshold. Viscoelastic relaxation may also accompany the static-fatigue crack growth. We define a viscoelastic relaxation speed as (G0/Wf)/tau, where tau is the viscoelastic relaxation time. When the crack speed is small compared to this speed, the viscoelasticity of the toughener is completely relaxed. Under the condition of small-scale inelasticity, a comparison of (G0/Wf)/tau and D/(G0/Wf) defines a dimensionless parameter: (G0/Wf)^2/(D*tau). When this parameter is small, viscoelasticity sets the relaxation speed to approach the static-fatigue threshold. When this parameter is large, poroelasticity sets the relaxation speed. Under the condition of large-scale inelasticity, the flaw-sensitivity length G0/Wf will be replaced by the relevant length of the sample. All hydrogels have time-dependent rheology. Yet, the long-time, slow-crack behavior of hydrogels approaches that of a material of time-independent plasticity. Elastic-plastic fatigue serves as a good starting point to study the complex behaviors. As an example, Qi et al. have analyzed toughness of soft materials of time-independent hysteresis . 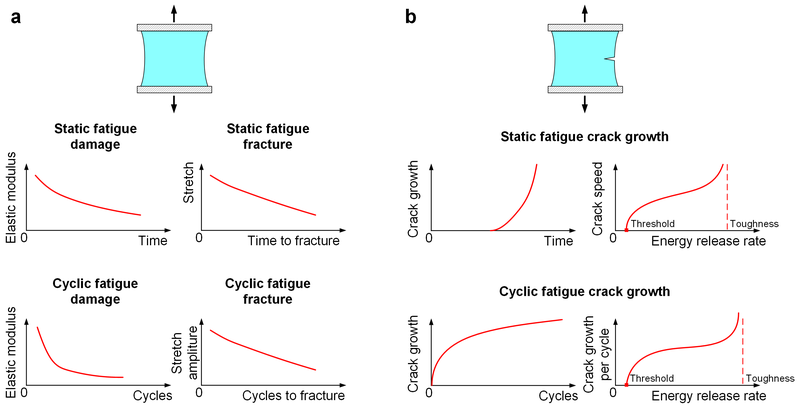 Designing a fatigue-resistant (i.e., endurant) hydrogel should address all symptoms of fatigue: change in properties, as well as nucleation and growth of cracks, in samples with and without precut cracks, under prolonged static and cyclic loads. One design principle has been recently demonstrated for endurant elastomers  and hydrogels . A composite can be made from a matrix of compliant (long-chain) network and fibers of a stiff (short-chain) network (Fig. 10a), both elastic, having high modulus contrast, and strongly adhering. The stress-stretch curve has low hysteresis cycle by cycle. When the composite with a precut crack is subject to a stretch along the direction of fibers, the soft matrix shears greatly at the crack front, and spreads large stress over a long segment of each fiber. When a fiber ruptures, all the elastic energy stored in the highly stretched segment is released. The fibers can be further replaced by aligned bundles of polymer chains at the molecular level in a double-network hydrogel (Fig. 10b). Also highlighted is the principle for anti-fatigue-fracture hydrogels recently demonstrated by Lin and Zhao et al. . They use crystalline domains to replace the single layer of polymer chains that dissipates energy at the crack front and determines the cyclic-fatigue threshold (Fig. 10c). The cyclic-fatigue threshold is enhanced to around 1000 J/m^2. For comparison, the highest cyclic-fatigue threshold achieved using a long-chain polymer network in a double-network hydrogel is about 500 J/m^2 . Fig. 10. Strategy for hydrogels of high endurance. (a) A composite with a matrix of compliant network and fibers of a stiff network, both elastic, having high modulus contrast and strongly adhering . (b) Bundles of polymer chains are aligned at the molecular level to deflect a crack . (c) Crystalline domains replace the single layer of polymer chains to dissipate more energy at the crack front . Experiment. Numerous opportunities exist in the experiment of fatigue of hydrogels. Hydrogels can be synthesized with various bonding chemistries, molecular topologies, physical conditions (e.g., temperature, water content, ambient solution, etc. ), and geometries. An adequate theoretical thinking together with carefully designed experiments can readily lead to proof of valuable hypotheses, or new discoveries previously unnoticed. The large variety of hydrogels makes many of their behaviors analogous to behaviors of metals, ceramics, porous media, and other well-studied material systems. Yet, these hydrogels are readily synthesized in university laboratories of modest means. Hydrogels provide a platform for us to study interesting mechanics, through making new discoveries as well as realizing old thoughts. Theory and computation. 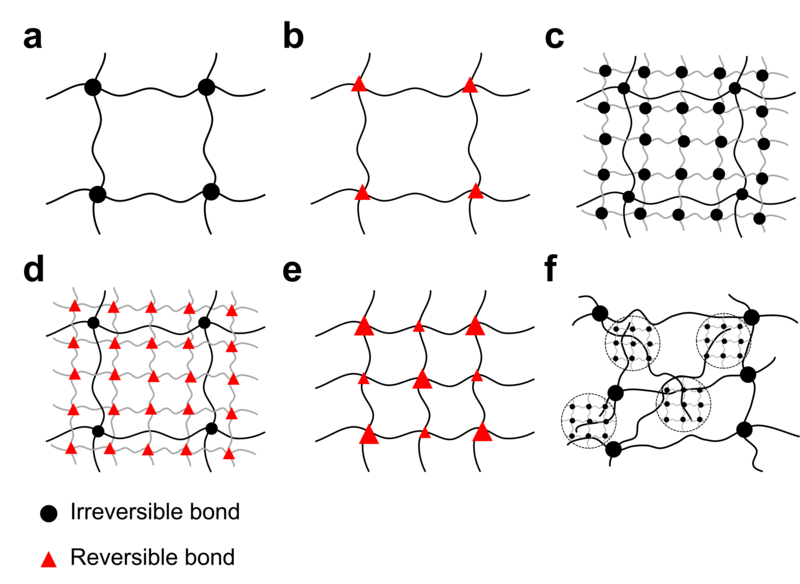 The various compositions and complex rheologies of hydrogels further motivate the development of theoretical models and computational methods, but also challenge the good agreement between theoretical predictions and experimental observations. After all, a quantitative agreement between theory and experiments is not common in fatigue. Valuable theoretical analysis and computation will inspire novel experiments and new discoveries, of which we have witnessed many examples in this field. We love to see your feedback. New opportunities, challenges, your own work in related fields, or your comments on anything related to this topic. Please leave your comment below. * In our review article, we wrote that the crack growth in elastomers under prolonged static loads was initiated by Mullins. While these two papers belong to the same series of articles, the paper by Greensmith and Thomas dated earlier. Wichterle O & Lim D (1960) Hydrophilic gels for biological use. Nature 185(4706):117. Tanaka Y, Fukao K, & Miyamoto Y (2000) Fracture energy of gels. The European Physical Journal E 3(4):395-401. Tang J, Li J, Vlassak JJ, & Suo Z (2017) Fatigue fracture of hydrogels. Extreme Mech. Lett. 10:24-31. Rivlin R & Thomas AG (1953) Rupture of rubber. I. Characteristic energy for tearing. J. Polym. Sci., Part A: Polym. Chem. 10(3):291-318. Thomas A (1958) Rupture of rubber. V. Cut growth in natural rubber vulcanizates. J. Polym. Sci. 31(123):467-480. Greensmith HW & Thomas AG (1955) Rupture of rubber. III. Determination of tear properties. J. Polym. Sci. 18(88):189-200. Creton C & Ciccotti M (2016) Fracture and adhesion of soft materials: a review. Rep. Prog. Phys. 79(4):046601. Long R & Hui CY (2016) Fracture toughness of hydrogels: measurement and interpretation. Soft Matter 12(39):8069-8086. Long R & Hui CY (2015) Crack tip fields in soft elastic solids subjected to large quasi-static deformation—A review. Extreme Mech. Lett. 4:131-155. Bai R, et al. (2017) Fatigue fracture of tough hydrogels. Extreme Mech. Lett. 15:91-96. Bai R, Chen B, Yang J, & Suo Z (2019) Tearing a hydrogel of complex rheology. J. Mech. Phys. Solids 125:749-761. Baumard TLM, Thomas AG, & Busfield JJC (2012) Fatigue peeling at rubber interfaces. Plastics, Rubber and Composites 41(7):296-300. Lake G & Thomas A (1967) The strength of highly elastic materials. Proc. R. Soc. London, Ser. A 300(1460):108-119. Zhao X (2014) Multi-scale multi-mechanism design of tough hydrogels: building dissipation into stretchy networks. Soft Matter 10(5):672-687. Zhang T, Lin S, Yuk H, & Zhao X (2015) Predicting fracture energies and crack-tip fields of soft tough materials. Extreme Mech. Lett. 4:1-8. Creton C (2017) 50th Anniversary Perspective: Networks and Gels: Soft but Dynamic and Tough. Macromolecules 50(21):8297-8316. Zhang E, Bai R, Morelle XP, & Suo Z (2018) Fatigue fracture of nearly elastic hydrogels. Soft Matter 14(18):3563-3571. Bai R, Yang J, Morelle XP, Yang C, & Suo Z (2018) Fatigue Fracture of Self-Recovery Hydrogels. ACS Macro Lett.:312-317. Zhang W, et al. (2018) Fatigue of double-network hydrogels. Eng. Fract. Mech. 187:74-93. Zhang W, et al. (2019) Fracture toughness and fatigue threshold of tough hydrogels. ACS Macro Lett. 8:17-23. Wang X & Hong W (2012) Delayed fracture in gels. Soft Matter 8(31):8171-8178. Chen C, Wang Z, & Suo Z (2017) Flaw sensitivity of highly stretchable materials. Extreme Mech. Lett. 10:50-57. Qi Y, Caillard J, & Long R (2018) Fracture toughness of soft materials with rate-independent hysteresis. J. Mech. Phys. Solids 118:341-364. Wang Z, et al. (2018) Stretchable materials of high toughness and low hysteresis. Proc. Natl. Acad. Sci. In press. Bai R, Yang J, Morelle XP, & Suo Z (2019) Flaw-Insensitive Hydrogels under Static and Cyclic Loads. Macromol. Rapid Commun. 0(0):1800883. Lin S, et al. (2019) Anti-fatigue-fracture hydrogels. Sci. Adv. 5(1):eaau8528. Permalink Submitted by Cai Shengqiang on Thu, 2019-02-28 23:55. Hi Ruobing, thanks for the review, really informative. Zhigang mentioned some of the results during his visit to UCSD. While I am still trying to understand all your discoveries, I have a small question. You mentioned the cyclic fatigue toughness of hydrogel with solid-like toughner can be much less than its static fatigue toughness. Any explainations? For ductile metal, I believe it is understood. During cyclic loading, dislocation accumulates around the crack tip, which results in crack growth. Permalink Submitted by Ruobing Bai on Fri, 2019-03-01 00:38. Thank you for the comment. Regarding the cyclic-fatigue threshold, we think the Lake-Thomas model is the molecular picture that happens at the crack front in a hydrogel with a long-chain solid-like primary network (such as polyacrylamide). As an analogy to ductile metal, during cyclic loading, the bond breaking of tougheners (either solid-like or liquid-like) accumulates around the crack tip, and the tougheners fail to toughen the hydrogel after many cycles of loads. The Lake-Thomas model basically says that by fracturing a single layer of polymer chains, the crack can grow, and the energy release rate required to do so is ~ 10-100 J/m2 for most hydrogels and elastomers. This is a small number compared to the fracture energy of many tough hydrogels. For a hydrogel crosslinked by some weaker noncovalent bonds (e.g., Ca-alginate, gelatin, etc. ), we also proposed a modified Lake-Thomas model in the review. The idea is still breaking a single layer of polymer chains, but now the polymer chains are modeled as entropic springs stretched to a force equivalent to the bond strength of the noncovalent crosslinks, instead of being stretched to their own bond strength (C-C bond in most cases) in the initial Lake-Thomas picture. For hydrogels with no tougheners (e.g., polyacrylamide), the cyclic-fatigue threshold is still one order of magnitude smaller than the bulk toughness. This remains to be a really interesting question to be addressed. One thought is that poroelasticity (water migration) may have some toughening effect, especially when there is a crack, the stress field is inhomogeneous, so is the chemical potential field. However on the other hand, the period of each loading cycle is rather short in experiments (1-10 s), which may hardly lead to any effective diffusion and toughening. If you have thoughts on this, I would love to hear. After all the Lake-Thomas model is qualitative, though some quatitative comparison seems to be okay (Fig. 7) in some range. A good quantitative theoretical model may be worth investigating here. Permalink Submitted by linst06 on Fri, 2019-03-01 00:41. This is very nice contructive and inspiring summary. I like it a lot. I am particualrly interested in poroleastic fatigue and viscoelastic fatigue. The time effect of poroelasticity and viscoelasticity on the total toughness is understood I think. I am trying to think through the molecular picture on the effect of poroelasticity and viscoelasticity on fatigue threshold. Can you give an example to give a more intutive explanation on both effects on fatigue threshold? Permalink Submitted by Ruobing Bai on Fri, 2019-03-01 01:23. This is a really interesting and challenging question! I will picture some totally intuitive effects now in my mind which I have no study to support but I think deserves more research. For poroelasticity effect on fatigue threshold, as you know that the adapted Lake-Thomas model for hydrogels includes the effect of swelling, and we had some measurement and comparison on that (Fig. 7). However, the local swelling ratio of the network should be different from the swelling ratio in the bulk material, due to the inhomogeneous stress field and chemical potential field. We did not accommodate this effect in our theoretical comparison. How to better analyze this local swelling ratio (which should be rate-dependent)? Modeling and simulation may help. Going even forward and thinking harder, what is essentially the fracture criterion now? It cannot simply be that the energy release rate becomes larger than some critical threshold value, because the threshold itself can be affected by diffusion. A cohesive zone-type model may work better. And yet, we have not even started to discuss the effect of chemical potential outside the hydrogel near the crack tip. For instance, different wetting at the tip can lead to different thresholds. For viscoelasticity effect on fatigue threshold, a viscoelastic hydrogel may be represented by an elastic primary network with some healable bonds as tougheners. The elastic network is essential since it motivates the recovery of shape (otherwise we are dealing with silly-putty). With this picture, the static-fatigue threshold by its definition is rate-independent, as it is measured by removing all the time-dependent dissipation. However the static-fatigue threshold may be much larger than the Lake-Thomas threshold. The cyclic-fatigue threshold, however, may be rate-dependent. What if the period of each loading cycle is long enough so that the healable bonds that are broken during one cycle can heal before the next cycle starts? Then these bonds may continuously toughen the hydrogel cycle by cycle. An extreme case is when the period of one cycle is infinitely long, then what you are measuring is the static-fatigue threshold. We have already shown that the static-fatigue threshold can be much higher than the cyclic-fatigue threshold we measured now. As you see there is a lot of room to progress here. Thank you again for bringing up this question. I also look forward to your input now. Permalink Submitted by linst06 on Fri, 2019-03-01 02:43. Thanks a lot for detailed explanation. I quite agree that modeling or simulation may give some more insights. Yuewei's FEM model could be a powerful tool. For the viscoelastic effect, I have the similar feeling as you. The difference between loading frequency and material time scale may affect the fatigue property of a hydrogel. Regarding the theory of fatigue process in hydrogels, I have been thinking the possiblities to use statistical mechanics to describe the fatigue features in a single network hydrogle. The physical picture is a fracture strain of a polymer chain, which has a defined probability distribution. Therefore, when a notched single network hydrogel is cyclically stretched, the polymer chain at crack tip have higher chances to break than the other far field chains. Following this picture, the fatigue crack curve can be theoreitcally calculated. I also tried to use ideal network to experimentally measure this. But it turns vrey hard. Do you have any idea how much role of the statistical rupture of polymer chain on fatigue fracture of hydrogels? Permalink Submitted by Ruobing Bai on Fri, 2019-03-01 14:51. I really like this idea of using statistical mechanics on fatigue. As I happened to start doing a few statistical mechanics modeling in the past half a year, I have some preliminary facts and thoughts to share. I do agree that we can have some good statistical models on local chain fracture, as I have seen some beautiful works by your group earlier and by Qiming recently. In addition, I also saw some statistics on fracture from recent works of Prof. Hui and Prof. Creton , and a few earlier papers I learned from them [2-4]. If you have more examples, I'd love to learn. On the other hand, when I recall some successful statistical mechanics models, such as Gaussian chain, Flory-Huggins, Ising model, and Cauchy-Born rule (I call it statistical since it sums up the energy by individual atoms), I feel that they all more or less successfully captured the major contributing items in the system in some range. When the system has additional important factors, for example, large stretch for a Gaussian chain, the model fails catastrophically, and you need to introduce these additional important things. However, these additional things can often be complicated and hard to describe, which in the end leads to failure of comparison between theory and experiment. I guess this is one of the essential challenges on modelling the fatigue fracture. Local statistics may be clear, but effects from other physics or from global may be hard. Examples are the viscoelasticity and poroelasticity. Regarding modeling these, the effective diffusivity of solvent in a network depends on the stress state, and the effective viscosity of a hydrogel often depends on the loading rate. This is where I think experiments, especially theory-guided experiments can make a contribution. I am quite positive that we can have a good physical understanding of the process with the combination of theoretical modeling and step-by-step clear experimental verification. Guo, J., Liu, M., Zehnder, A. T., Zhao, J., Narita, T., Creton, C., & Hui, C. Y. (2018). Fracture mechanics of a self-healing hydrogel with covalent and physical crosslinks: A numerical study. Journal of the Mechanics and Physics of Solids, 120, 79-95. Skrzeszewska, P. J., Sprakel, J., de Wolf, F. A., Fokkink, R., Cohen Stuart, M. A., & van der Gucht, J. (2010). Fracture and self-healing in a well-defined self-assembled polymer network. Macromolecules, 43(7), 3542-3548. Hansen, A. C., & Baker-Jarvis, J. (1990). A rate dependent kinetic theory of fracture for polymers. International Journal of Fracture, 44(3), 221-231. Zhurkov, S. N., & Korsukov, V. E. (1974). Atomic mechanism of fracture of solid polymers. Journal of Polymer Science: Polymer Physics Edition, 12(2), 385-398. Permalink Submitted by wvmars on Fri, 2019-03-01 09:34. Permalink Submitted by Ruobing Bai on Fri, 2019-03-01 13:46. Indeed! Zhigang mentioned to me the cutting method (I recall from your previous discussion) and it has been on our to-do-list for some time, but we have not yet started any serious measurement. Comparing thresholds measured via different methods is the primary goal, and the cutting method may bring some additional advantage on the simplicity and efficiency of measurement. Thank you for bringing this work to this discussion. We have been inspired a lot by your previous work. Permalink Submitted by Jingjie Hu on Fri, 2019-03-01 14:46. I really enjoyed reading this review. Thanks for sharing. It seems to me the hydrogels described in this review have relatively "defined shape". For instance, their crack growth and elongation can be monitored. In terms of soft and deformable hydrogels (e.g., certain nanocomposite hydrogels for woundhealing and hemostasis, usually characterized by rheometry), would the methods reviewed in this paper still be applicable? These gels can deform under stress/strain and recover upon strain/stress removal, whereas their fatigue behavior are not explicitly ellucidated. Another example is the decellularized organ ECM hydrogels for tissue engineering. Not sure if their crack initiation and propagation have been studied. I have always been curious about how to assess fatigue behavior in those types of hydrogels since their long term behavior in the body is crucial. Any ideas would be greatly appreciated! Permalink Submitted by Ruobing Bai on Fri, 2019-03-01 16:42. I think the methods reviewed in this paper will be applicable to hydrogels like nanocomposite and the decellularized ECM. So long as the hydrogel is not too soft (for example, on the order of 10-100 Pa modulus) or too brittle (for example, 1 J/m2), it should be able to hold the tensile testing. Nanocomposite hydrogels for would healing and hemostasis are often tough enough and not too soft, so they should have no difficulties to be tested. Nanocomposite hydrogel is an interesting material, since the interaction between the nanoparticles and the matrix can be tuned in a large range and related to the use case, and the bond healing will lead to some interesting unexpected results. One of the key challenges is to obtain a clear physical picture and description from the experimental measurements, to extract valuable information. I am not familiar with fracture studies of the decellularized organ ECM hydrogels, but I feel the argument is similar, and the methods should be applicable. People did report some fracture and adhesion tests on skins [1,2]. I look forward to your contribution to fatigue behaviors of these hydrogels from the perspective of biological engineering! Wu KS, Stefik MM, Ananthapadmanabhan KP, & Dauskardt RH (2006) Graded delamination behavior of human stratum corneum. Biomaterials 27(34):5861-5870. Shergold OA & Fleck NA (2005) Experimental investigation into the deep penetration of soft solids by sharp and blunt punches, with application to the piercing of skin. J. Biomech. Eng. 127(5):838-848. Permalink Submitted by Jingjie Hu on Fri, 2019-03-01 18:31. Thanks for your reponse. The ECM hydrogels (e.g. heart) are actually very soft. For example, uncrosslinked heart ECM gel has a storage modulus ~10 Pa at body temperature , and people have used this type of hydrogel for cardiac repair. Depending on protein concentration and the type of organ, the value would vary but the majority of the values are below 100 Pa . So it would be too soft for tensile testing. Perhaps this is not a conventional type of hydrogel that we are talking about, but it would still be nice to investigate. Permalink Submitted by Ruobing Bai on Fri, 2019-03-01 19:06. Thank you for providing this valuable data. In that case, you may consider using peel. Peel can utilize stiff and inextensible backing layers, and the hydrogel can be bonded to the backing layers and stay in between, serving as an adhesive. Then the fatigue test of the hydrogel can be done using peel. The interfacial bonding between the hydrogel and the backing layers needs to be strong enough to induce only cohesive fracture inside the hydrogel. The backing layers do not need to be ideally inextensible, as long as its modulus and toughness are much higher than the hydrogel. Therefore, I am positive that there is a large room for tuning the test and getting useful results here. This class of materials is definitely worthwhile investigating! Permalink Submitted by Tang jingda on Sat, 2019-03-02 02:40. I am very interested in your discussion. In fact, I have tried the fatigue tests of nanocomposite hydrogels. Our finding is that, this kind of hydrogels shows giant residual deformation in cyclic pure shear test. The residual deformation increases gradually with cycles, so the effective load applied on the crack is decreasing. The crack advances very little after a long time test. Their fatigue behavior is very different to the hydrogels in the published works. I think pure shear test may be not a good choice for probing this kind of hydrogels. I want to hear both of your opinions on our preliminary finding. Thank you! Permalink Submitted by Jiawei Yang on Sat, 2019-03-02 14:39. The nanocomposite hydrogel seem like a plastic liquid. My thought is that find a way to adhere the gel on a substrate, make a cut to the gel, ensure stretchable interface, and do cyclic tests on the substrate. You observe crack growth with cycles. Permalink Submitted by Tang jingda on Sat, 2019-03-02 20:26. This is really a good suggestion. Thank you, Jiawei. Permalink Submitted by Ruobing Bai on Sat, 2019-03-02 14:58. Thank you for the informative comment. I now remember even last summer when we were talking about this I was not very clear about some things in my mind as I am now. Now I agree with Jiawei's comment that using substrates for this material may be a good idea. There is standard testing method to use peel to test fatigue crack growth. In addition, since nano-composite hydrogel is such an interesting material with respect to its rate-dependency, one might make new discoveries in its fatigue measurement. Peel/tear allows you to localize the deformation and well control the crack speed. Even the results from static-fatigue v-G curves will be really interesting! Permalink Submitted by Jingjie Hu on Sat, 2019-03-02 22:55. Thanks for sharing your findings. I appreciate it a lot! Nanocomposite hydrogels (also ECM gels and other injectable hydrogels) are usually characterized by rheology, so their recovery and self-healing properties can be examined through strain rate oscilation. Whereas their microstructure changes during fatigue are lacking and there seems to be no specific fatigue testing in rheology. Jiawei's idea sounds good to me, and I look forward to reading your work in this area! Permalink Submitted by Jiawei Yang on Sat, 2019-03-02 14:34. For those hydrogels that are either too soft to handle or too difficult to make a "good shape", an alternative method could be attaching the gel on a strectable substrate (e.g., rubber), make a cut to the gel, and cyclically stretch the substrate, you observe how the crack grows in the gel. Of course, interfacial debonding needs to avoid. Permalink Submitted by Jingjie Hu on Sat, 2019-03-02 22:58. This approach sounds good and it is definitly worth a try. Thank you! Permalink Submitted by Tang jingda on Sat, 2019-03-02 02:26. What a comprehensive review on this nascent field. Thank you for introducing our early paper on the fatigue of hydrogels. When I started this project, I can never imagine this field can advance so fast and deep. The summarized hydrogel chemistry and mechanical method are instructive to us to study more hydrogels with appropiate methods. I have a general question, which always puzzles me for a long time. What do you think of the difference between rubber and hydrogels in terms of fatigue behavior? What is the role of water molecule in cyclic test? This kind of study is still lacking. In the study of fatigue of rubber, little has been done to connect the chemistry of rubber to their fatigue behavior. Here, you show the strong connection in hydrogels. Is this because the hydrogel has a much more diluted polymer network than rubber, thus it is easier to use the fatigue behavior of hydrogels to probe their chemistry? Permalink Submitted by Zhigang Suo on Sat, 2019-03-02 13:33. Jingda: I still recall the time when we muddled through your 2017 paper on fatigue crack growth in hydrogels (Fatigue fracture of hydrogels). Long before the paper was written, we knew the paper would be the first report of cyclic fatigue crack growth in any hydrogel. So what? We asked ourselves. We showed your video of cyclic crack growth in polyacrylamde hydrogel to Jianping Gong when she visited Harvard in July 2014. She was intrigued. We used polyacrylamide hydrogel for a simple reason. Polyacrylamide hydrogel have just two constituents: water and a covalent polymer network. When a sample of polyacrylamide hydrogel with no precut crack is subject to cyclic stretch, the material has near perfect elasticity, with very narrow hysteresis. Before your experiment, our hypothesis was that polyacrylamide hydrogel would not suffer fatigue crack growth. We thought that the polyacrylamide hydrogel should be glass-like: brittle, but not susceptible to cyclic crack growth. Well, your experiment showed our initial hypothesis was wrong. Polyacrylamide hydrogel does suffer cyclic fatigue fracture. This observation has been amply confirmed by later experiments. We did publish the paper in 2017, but the mechanism of fatigue remains inconclusive to this day. We now say, perhaps polyacrylamide is not elastic enough. The 2017 paper identified two thresholds: the threshold for the growth of crack under static loading, and the threshold for the growth of crack under cyclic load. We did not understand this difference then, but we do now. The difference has become a main point of discussion in a recent JMPS paper (tearing a hydrogel of complex rheology). You ask, what is the difference between hydrogels and elastomers in fatigue? Some difference is just as you noted. A hydrogel has a lot water. Because water has low viscosity, polyacrylamide has low hysteresis. One can, of course, find a low viscosity solvent to swell an elastomer, but that will be unusual. The abundance of water also causes inconvenience. To avoid dehydration, fatigue experiment need be conducted in a humidity controlled environment. Perhaps most importantly, hydrogels of various chemistries of bonds and topologies of networks can be readily synthesized in academic laboratories of modest means. Each topology shown in Fig.2 of Roubing’s post corresponds to a distinct type of mechanical behavior. Many more topologies are possible. This diversity in topology is readily realized in hydrogels. Furthermore, hydrogels can mimic living tissues with high fidelity, chemically, mechanical, and electrically, and have enabled an enormous and fast expanding field of bioinspiration and biointegration (See section 2 of the review). Hydrogel or elastomer? They are similar in many ways, and different in many other ways. In formulating a new project, it is always worthwhile to ask, why should we choose any particular material? Both hydrogel and elastomer deserve our attention. Permalink Submitted by Tang jingda on Sat, 2019-03-02 20:37. Zhigang: Thank you for your comprehensive reply. The review offers a broad perspective (chemistry, mechanics) and extensive knowledge to us. Permalink Submitted by linst06 on Wed, 2019-03-06 19:25. It's very nice to see you in the APS meeting. Your talk is as always fascinating. I did learn a lot. This review and the set of papers on fatigue fracture in hydrogels from your group are the pioneer work for the direction of design of high performance hydrogels for practical applications. One of the merits that excits us is that a new property (i.e., fatigue threshold) is defined for hydrogels. Fatigue threshold is not new for elastomers, which I learned from your fracture mechanics course. But for hydrogels, it is overlooked although the development of tough hydrogels has been for decades. After I carefully read Jingda and ruobing's papers (have some sense on the mechanisms of fatigue in hydrogels) years ago, I have a strong motivation to improve this property in hydrogels. Xuanhe had a very good sense and told me to find some way to impinge crack over cycles could be way to go. Therefore, I dig into PVA, a well-known hydrogel material developed by Peppas, which can readily form crystalline domains by a few approaches. My recent work (S. Lin, et al, Science Advances, 5, eaau8528, 2019) is still quite preliminary result or little effort toward the target of enhancing this number (fatigue threshold). Biological tissues can smartly assemble to hierachical structures with ordered crystalline domains. However, it turns to be still quite hard to engineer crystalline domains in synthetic hydrogles. I am aware of a few approaches such as cold-drawing, hot-drawing, pre-stretching in air. But these approaches still sacrifice a few other properties such as high water content and superior compliance. BTW, I did notice your group also have a few approaches to enhance fatigue threshold. Look forward to the coming papers in your group and I am eager to read them and learn from them! Another merit inspired by the pioneer work from your group is that the huge practical implications enabled by the understanding of fatigue fracutre in hydrogels. Hydrogel devices/electronics/robotics are booming in recent years. But most of these work are still limited in laboratory work and far away from practical usages. One of the reasons for the practical limitations of hydrogels for long term usage is their poor fatigue property. Hydrogels can be as strong as wood, can be as tough as rubber, but still easily lose their functions over cyclic usages. Not only due to mechanical fatigue, long term failures or disfunctionalities can also be caused by aging, degradation, etc. Our current collaborative work on ingestible device (X. Liu, et al, Nature Communications, 10, 493, 2019) is an initial trial to demosntrate that ingestible device made of hydrogels can sustain up to one month in a pig stomach. I have the feeling that more and more hydrogel-based devices/electronics/robotics can be eventually practical, thank to the initial foundation work by your group. I am personally very excited, motivated about and inspired by the hydrogel work from your group, starting from the classical coupled diffusion theory for hydrogels to the recent fracture, fatigue, and adhesion work. It's quite pity that I didn't find chances to talk more with you during this APS meeting since I only stay half day in the meeting conference. Look forward to meeting you and having discussion with you next time, also look forward to your comments and suggestsions. Permalink Submitted by Zhigang Suo on Wed, 2019-03-06 20:46. Shaoting: Thank you for your kind comments. The development of hydrogels is motivating a large number of people to work on the mechanical behavior of materials. We no longer have to work on well established commercial materials. We can cook up new materials, or mix old materials in new ways, or discover properties unimagined before, or just imagine new ways of using hydrogels. It is an exciting time. Everyone has an opportunity to do something extraordinary. Your work has caught international attention, even before you have your PhD. Permalink Submitted by Ruobing Bai on Sat, 2019-03-02 15:27. Dear Jingda: indeed, as you can see the discussion with Shaoting above, the role of water molecules in fatigue deserves much more study, and this is where professionals in theory/simulation and poroelasticity can make a difference. When people ask a general question: why hydrogel? This is also the first answer coming to our mind: water. In addition, let me add two points on the difference between the rubber and hydrogel fatigue behaviors, which you already know. Natural rubbers form crystallization under large stretch, which dissapears when the stretch is gone. The melting point of crystallization is below room temperature. Therefore, cyclic fatigue crack growth in natural rubber can induce crack deflection, which serves as a self-activated "toughening" mechanism for fatigue. This is somewhat similar to what we have now for endurant hydrogels/elastomers in Fig. 10, but natural rubber can do this itself. I am not following this study closely, but it always intrigues me whether we can design some similar things. Natural rubbers typically have a glassy region in the plot of modulus vs. frequency, at very high loading frequency. I don't know if there is any study on high-frequency fatigue of rubbers, which approaches this range of high frequency. This can be something to explore in hydrogels then. Permalink Submitted by Rong Long on Sun, 2019-03-03 16:53. Thanks for this very informational and inspiring review. I have learned a lot! A quick question: it is intriguing to see that the static fatigue threshold and cyclic fatigue threshold can be very different even for hydrogels with relatively simple molecular structure (e.g. polyacrylamide gel). However, intuituively I would think the Lake-Thomas theory could be used to explain the threshold for both cases (static and cyclic fatigue). Although there could be some differences between static and cyclic loadings (e.g. as pointed in your reply to Shengqiang, water migration may alter the loading-bearing pattern of the network at the crack tip), such differences are presumably second-order. It is difficult to understand that they could lead to large differences. How large is the difference between the static and cyclic threholds for polyarcylamide gels? Is it by orders of magnitude or is the difference second-order? Many thanks in advance! Permalink Submitted by Ruobing Bai on Sun, 2019-03-03 19:29. The only quantitative comparison between the static-fatigue and cyclic-fatigue thresholds of polyacrylamide gel is from the first paper Fatigue fracture of hydrogels. In this paper, the static-fatigue threshold (or called delayed-fracture threshold by then) was measured using pure shear, and was found to be larger than the cyclic-fatigue threshold in a range of compositions. You are right, the difference is a few J/m2 compared to the threshold of ~ 10-30 J/m2, so it is "second-order". The contrast in experimental observations over such a few J/m2 different load, however, is sharp and clear (delayed fracture or not delayed fracture). Note that for Ca-alginate-polyacrylamide, the static-fatigue threshold is also larger than the cyclic-fatigue threshold, and we believe we have understood this observation (tearing a hydrogel of complex rheology). For polyacrylamide, I share the same picture with you, that the Lake-Thomas theory could be used to explain both thresholds qualitatively, despite some secondary difference. Therefore, it seems that there is a competition between poroelastic and (visco)plastic toughening on the thresholds measured under different loading conditions. Such competition is not prominent in polyacrylamide or in Ca-alginate-polyacrylamide, but may be important and interesting to study for some hydrogel systems (with a very viscous solvent, for example). Permalink Submitted by Rong Long on Tue, 2019-03-05 18:10. Thanks for the detailed answer. I understand it now. Yes, it would be intersting to study how various toughening mechanisms affects the threshold. It might offer some insights on how the toughening mechanisms affects the molecular structure at crack tip. Thanks again for the insightful review. Really interesting! Permalink Submitted by 706430871@qq.com on Mon, 2019-03-18 18:39. Here is one hypothesis we have trying to understand the discrepancy between static-fatigue threshold and cyclic-fatigue threshold of polyacrylamide hydrogel. In one of our recently submitted papers, we attribute this discrepancy to the network imperfection. By network imperfection I mean that long chains and short chains coexist in the polymer network. Subject to a stretch, the short chains will break and the long chains remain intact. The breaking of short chains happens over a large volume of the testing sample. Such distributed chain scission dissipates energy. Unlike poroelastic process and viscoelastic process, distributed chain scission is insensitive to loading rate. In this sense, the short chains act like solid-like tougheners. As a result, the distributed chain scission amplifies the threshold for crack growth under a static load, but contributes negligibly to the threshold for crack growth under cyclic load. In studying the mechanical properties of hydrogels, network imperfection deserves our attention, just as viscoelasticity, and poroelasticity. Permalink Submitted by Ruobing Bai on Mon, 2019-03-18 23:39. Thank you for contributing to this question and providing this understanding. I guess the idea of imperfection echoes Shaoting's statistical model to some extent. It will be very interesting to see how large the contribution of network imperfection can make to the toughness of hydrogels measured in different loading conditions. I look forward to reading your paper. Permalink Submitted by Cai Shengqiang on Thu, 2019-03-21 03:44. It is an interesting thought. I look forward to reading the paper. The hypothesis does make sense to me. One question: if it is the case, such difference between static fatigue and cyclic-fatigue should not be unique to hydrogel, but can be also seen in dry elastomer, right? Has any one reported that? Permalink Submitted by 706430871@qq.com on Thu, 2019-03-21 16:18. I agree with you that, if network imperfection is the dominant factor, the difference between static fatigue threshold and cyclic-fatigue threshold should not be unique to hydrogels, but should be generic for other polymer networks. For elastomers, both cyclic fatigue (e.g. Lake & Lindley, 1965; Lake & Thomas, 1967) and static fatigue (e.g. Ahagon & Gent, 1975) have been studied. Threshold for cyclic fatigue is about 50 J/m2. Threshold for static fatigue has a range, from ~40 to ~80 J/m2. It’s hard to say whether the two thresholds are the same or not just by looking at the numbers. The uncertainty comes from many reasons. For example, natural rubber vulcanizate is used for cyclic fatigue test (Lake & Lindley, 1965), while polybutadiene elastomer is used in static fatigue test (Ahagon & Gent, 1975). The chemistry of polymer network, crosslinking density, synthesize procedure and temperature, etc., are scattering factors to the measurements. Mechanical performances of elastomers are often viscoelastic. In static fatigue test, viscoelastic effect can be minimized by using low loading speed. By contrast, in cyclic fatigue test, the loading speed is usually fast because of practical reason. Viscoelasticity can relax during the repeated loading and unloading. But to what extent can we ignore viscoelasticity? Crack growth shouldn’t happen only after fully viscoelastic relaxation. To get rid of viscoelasticity, tests can be done under elevated temperature or using oil swollen elastomers. But I haven’t seen any literature exclusively studying static fatigue and cyclic fatigue in elastomers. Network imperfection has been intensively studied in elastomers. But its role in fatigue is blank. For hydrogels, the beauty is that a hydrogel of high water content is highly stretchable but negligibly viscous. We can disregard viscoelasticity in most cases. Poroelasticity shows up in hydrogels but in a controllable and predictable way. Experiments on the compare of static fatigue and cyclic fatigue are very limited. Available data are contributed by Jingda Tang (J. Tang, et. al, 2017). The experiments were not on purpose carried out to study the difference between static fatigue and cyclic fatigue. But their data do show that the static fatigue threshold (somewhere between 14.7 and 19.3 J/m2) is larger than the cyclic fatigue threshold (somewhere between 7.18 and 4.19 J/m2). With existing data, we can’t tell what causes the difference, even we exclude all other factors such as viscoelasticity, chain pull-out or stress corrosion are negligible except poroelasticity and network imperfection. Let’s focus on polyacrylamide hydrogels, based on Jingda’s data, the delay time for fracture ranges from tens of seconds to ~200 seconds, about three orders of magnitude lower than the poroelastic relaxation time given the relevant sample size of 3 mm and D~10^-10 m2/s. If we surmise network imperfection, we use a material specific length, Gamma/Wf, instead of the sample size. Here Gamma is the threshold toughness measured in static fatigue and has a unit of J/m2. Wf is the work of fracture (area under stress-stretch curve) measured in tensile test with sufficiently low loading speed and has a unit of J/m3. In the paper, Gamma is on the order of 10 J/m2, Wf has not been reported, but we assume it has the same order of magnitude with that measured under normal speed, on the order of 10^5 J/m3, then these value give a length on the order of 10^-4 m. This is the size of swelling zone/fracture process zone in front of the crack tip. The time needed for poroelastic relaxation of this zone is on the order of 100 s, comparable to experimental data. These seem to indicate that, on one hand, due to network imperfection, the relevant length is not the sample size, but the material specific length, Gamma/Wf. On the other hand, due to poroelastic relaxation of the swelling zone/fracture process zone, crack propagates and eventually ruptures the hydrogel. However, the above discussions are based on two assumptions: the value of Wf and the value of Gamma/Wf. Experimental evidences are missing. Permalink Submitted by Cai Shengqiang on Fri, 2019-03-22 16:03. Canhui, Many thanks for the further elaboration. It all makes sense to me. Permalink Submitted by tongqing.lu on Wed, 2019-03-06 03:07. Thanks for such a clear and insightful review. I really learn a lot and I like many new ideas in the review. I have a few questions or comments. 1. Similar to the question of Rong, I wonder what caused the difference of static fatigure threshold, the cyclic fatigue threshold and the Lake-Thomas threshold. Let's say if we can design an experiment such that the time-depenent effects of poroelasticy and viscoelasticy are small, would you think these thresholds coincide? 2. I notice that you mentioned a few times that the Lake Thomas model could only "qualitatively" predict the threshold. In fact, we have some unpublished data which, to some extent, quantitatively agree with the theoretical prediction. These data may further enrich the available database of "fatigue of hydrogels". 3. A student here in XJTU was trying to conduct the fatigue experiment by peeling test. Besides the effects you have discussed in your review, such as large/small scale inelasticity, etc, what else benifit do you think we have from a systemtic experiment? Would you comment on that? Thank you! Permalink Submitted by Ruobing Bai on Wed, 2019-03-06 14:35. Thank you for the interesting questions. For many rubbers, my impression from many papers is that the two thresholds coincide, and can be predicted by the Lake-Thomas model. I think this is because the major dissipation in these rubbers is from viscoelasticity, and the viscoelastic relaxation time is very long (> days) so that the frequency of cyclic loads doesn't matter much. I am not aware of any study on time-independent dissipation toughening the static-fatigue threshold. If you know, I'd love to hear. For hydrogels, things can be complex. Hydrogels have water, so poroelasticity exists. If a hydrogel dissipates mainly through poroelasticity and viscoelasticity, then I believe indeed the Lake-Thomas model can describe both thresholds. However, the static load can reach equilibrium given enough time, but the cyclic load may never reach equilibrium, but rather a steady state. Even though the dissipation from poroelasticity and viscoelasticity in both cases is small, the local swelling ratio of the network may be different, and the two thresholds may not coincide, despite that they are both predicted by the Lake-Thomas model using different swelling ratios. This corresponds to my answer to Rong. However, for polyacrylamide, such difference seems small. 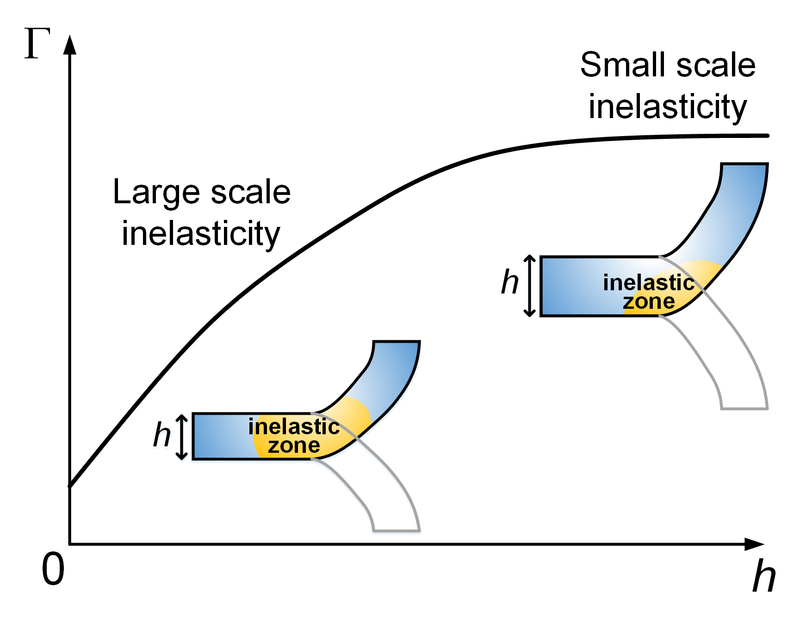 If a hydrogel has large time-independent elastic-plastic dissipation, then the cyclic- and the static-thresholds can be different by orders of magnitude, as our recent JMPS paper shows. The Lake-Thomas model is an ideal picture. A discrepancy may result from experimental conditions, or the local swelling ratio that we have not taken care of, or our adaption of the model to hydrogels (for example Fig. 7 does not match well for some water content, but this could result from the assumption of Gaussian chain). In many cases we do find quantitative agreement. If you have additional data to support, I am excited to see them. I am especially interested in some comparison with respect to different crosslink densities. For the last question, as people pointed out above, peeling has some unique advantage for hydrogels that cannot fully recover their shapes after elongation. In their original paper (1958 Thomas Rupture of rubber. V.), Thomas used different testing methods to measure the cyclic fatigue growth and found some coincidence. Comparison of thresholds using different testing results has not been systematically conducted in hydrogels. Besides, in peeling, different wetting conditions at the crack tip may play an important role, and further link to valid theoretical analysis. Permalink Submitted by tongqing.lu on Wed, 2019-03-06 21:01. Thanks for your explanations on the Lake-Thomas threshold. I now see the point that the poroelasticity always plays a role in affecting the cyclic threshold. Your idea of large time-independent elastic-plastic dissipation is important and I understand more clearly now. Our data indeed correlates with different crosslink densities. But as you said, there is discrepancy resulting from experimental conditions so that the fitting pre-factor is not quite close to 1. Permalink Submitted by Zhengjin WANG on Sat, 2019-03-09 21:47. Thank you for your comprehensive review on this nascent but fast moving field, and your introduction on our recent work on designing endurant stretchable materials. Stretchable materials such as elastomers and gels enable the field of soft (and possibly biocompatible) systems. Examples include stretchable electronics, soft robots, ionotronics, drug delivery, and tissue regeneration. Most applications require stretchable materials that dissipate little energy during normal operation of cyclic loads (low hysteresis), but dissipate much energy to resist rupture (high toughness), and survive prolonged cyclic loads (fatigue resistant). However, from study of you and some other researchers, the current toughening strategy of adding sacrificial bonds(no matter recoverable or not) into the primary network does not help to enhance the endurance of hydrogels under cyclic load. Clearly, existing stretchable materials cannot meet these requirements simultaneously. It is our opportunity to bridge the gap between existing materials and the requirements of real engineering applications. In our recent work titled "Stretchable materials of high toughness and low hysteresis", we describe a principle of stretchable materials that achieve both high toughness and low hysteresis. We illustrate this principle using a composite of two constituents: a matrix of low elastic modulus, and fibers of high elastic modulus (Fig. 10a in your review). Both the fibers and matrix are stretchable and elastic(low hysteresis). At a crack front, the soft matrix shears greatly, spreading large stretch in a long segment of each fiber. The crack may bifurcate near the fiber/matrix interface and further increase the length of the highly stretched segment. When a fiber ruptures, all the elastic energy stored in the highly stretched segment is released. This process is analogous to that in a single polymer network, but achieves high toughness because rupture releases energy in a fiber segment, rather than that in a polymer chain. The former has a much larger volume than the latter. The composite retains the low hysteresis, but is much tougher and more fatigue-resistant than the constituents. A composite of uniaxial fibers resists fracture in one direction, but ruptures readily in other directions. A laminate with multidirectional fibers resists fracture in many directions, but can still delaminate easily. A composite of a three-dimensional lattice of one material in a matrix of a much softer material will resist cracks in all directions. The same principle applies to elastomers, gels, and elastomer-gel hybrids. This class of materials provides opportunities to create high-cycle and low-dissipation soft robots and soft human-machine interfaces. Permalink Submitted by Ruobing Bai on Sun, 2019-03-10 18:48. Thank you for sharing this work. It will be exciting to see this design principle to be applied in endurant hydrogels in the near future. Permalink Submitted by Xuanhe Zhao on Thu, 2019-03-14 22:50. 1. How do you measure (or define) the fatigue threshold in the experiments? 2. How to control such diverted crack propagation in practical applications such as Stretchable Ionics? 3. Based on (and beyond) the Lake-Thomas model, we proposed a design principle for anti-fatigue-fracture hydrogels is "to make the fatigue crack encounter and fracture objects requiring energies per unit area much higher than that for fracturing a single layer of amorphous polymer chains". We demonstrated one example that uses nanocrystalline domains to arrest fatigue cracks in hydrogels, achieving fatigue threshold of 1000J/m2 . Would it be possible to design the high-energy phase in  to surround and arrest the fatigue crack? Permalink Submitted by Ruobing Bai on Fri, 2019-03-15 00:56. Thank you for your high encouragement and important questions. Indeed, in this preliminary demonstration, although the crack is diverted, it still propagates following the diverted direction when the load is large enough. Therefore, in the paper, we reserved to call the current proposed hydrogel "fatigue-resistance", but rather just flaw-insensitive (not to mention that we did not eliminate fatigue damage in this case). Because the crack is diverted and never propagates along its initial direction until the whole sample ultimately fractures somewhere else, the fatigue threshold is not defined or measured in the experiments. However, we did measure the "degree" of anisotropy necessary to be achieved in terms of the fracture energy ratio between the transverse and aligned directions of the material (Fig. 3 of the paper). Before reaching this anisotropy degree, the crack either propagates along the original direction, or follows some branched or serpentine directions. In practical applications, if the material is mainly subject to a uniaxial stretch, then this crack deflection strategy can be readily applied, just as the case of living hinges and wrapping straps using fatigue-resistant isotactic polypropylene in our daily life. If the working condition is more complex, one may be able to use the above-mentioned method of tuning the degree of anisotropy to achieve some specific direction of crack propagation. In a linear elastic material, such on-demand direction of crack deflection can be theoretically predicted. One can also make efforts to theoretically predict this in the more complicated hydrogel systems. However, I do not think the above way of tuning the degree of anisotropy and achieving on-demand crack deflection is the ultimate solution, and this is related to the third question. Looking at the literature and the great nature, we see that the idea of crack deflection is not new in composites or other materials, from synthesized polypropylene/polyethylene, to fiber-reinforced composites, to many biological systems such as bones and bamboos. Some biological systems can do even better, such as the hierarchical structures of some fish scales and nacres. To push this principle in hydrogels further, the next thing I think worthwhile to pursue, and would like to pursue myself, is to build such a hierarchical structure mechanically finely designed, which can arrest crack with high energy dissipation in all directions. A preliminary idea is to design some laminated/interweaved hydrogel structures, with aligning in all directions. Strong adhesion can be achieved (thanks to a lot of recent works from your group and other colleagues) between different layers or interweaved fibers and matrix to reinforce the whole structure, while the high-energy phase of the aligned polymers/fibers/crystalline domains in different directions can effectively arrest cracks in an isotropic manner. I hope I have answered your questions through sharing these perspectives. As you see, I believe the ultimate strategy for resistance to fatigue fracture is to induce some much higher energy dissipation at the crack tip beyond the Lake-Thomas picture. Based on this, I think utilizing hydrogel composites, or some composite effect in hydrogels (such as aligned polymer chains, phase separation like crystallization, etc.) is a promising direction for fatigue-resistant hydrogels. Composites may further benefit the goal of multi-functionality in many hydrogel devices. We can learn a lot from the previous works on other materials of our forerunners, we can learn perhaps even more from nature, and we can potentially create something new. Permalink Submitted by tongqing.lu on Wed, 2019-03-20 04:54. 1. When the crack deflects, the remaining part is safe and only one slice of material fails. In nature, such as bones, what is the size of the single slice of material? Could you give some examples? 2. You mentioned you made the anisotropic composite at the molecule level. As I understand, the main anisotropy is introduced by a mechnical prestretch when the material is in use. Is it possible to bulid in the pre-stretch in the molecule level? I heard of IPN before but don't really know how to do it. 3. What if the crack happens to align with the weak direction? I mean what's the solution in nature? Permalink Submitted by Ruobing Bai on Wed, 2019-03-20 14:00. 1. Here is a beautiful review on the toughening of bones written by Launey, Buehler, and Ritchie , together with a recent broader review on toughening bioinspired materials by Wegst, Ritchie, et. al . The fiber-like osteons in a bone have a size on the order of 100 micrometers. The fiber-like cell-wall layers in a bamboo have a similar size. The fibrils composing these structures scale down to ~nm. Crack deflection and twist observed in bones takes place at a scale of 100 micrometers. However, it is probably improper for us to call them single slice of material, since these biological systems really utilize their hierarchical structures for toughening. In addition to crack deflection, energy dissipation through breaking weak bonds between fibers can have a significant contribution. Our current system does not have such a high fidelity. 2. For building anisotropy in a network, mechanical prestretch is a cheap and effective way. People have also tried microfluidics/shear flow. For certain molecules, such as liquid crystal polymers, in addition to these methods, one can use surface alignment (for thin samples), or alignment induced by external fields such as optical, electric, and magnetic, and then crosslink the network. A recent paper published in Science by the group of Prof. Jian Ping Gong utilizes both mechanical prestretch and regrowth/heal of chemical bonds to achieve anisotropy. 3. Related to the first question, the natural materials really have multiple mechanisms for toughening at multiple scales. This is to some extent similar to the idea of toughening fiber-reinforced composites, where the interfacial bonding is tuned to be intermediate to achieve highest toughness. Also see this related iMechanical Journal Club by Prof. Teng Li: Rethink Wood. I am personally really excited about this field of bio-inspired structuring and toughening, especially the connection to hydrogels and other soft materials. Many things can be done by learning from nature and combining some creativity. Launey, M. E., Buehler, M. J., & Ritchie, R. O. (2010). On the mechanistic origins of toughness in bone. Annual review of materials research, 40, 25-53. Wegst, U. G., Bai, H., Saiz, E., Tomsia, A. P., & Ritchie, R. O. (2015). Bioinspired structural materials. Nature materials, 14(1), 23. Permalink Submitted by tongqing.lu on Wed, 2019-03-20 21:59. Thank you Ruobing. I will carefully read the reference papers. The bio-inspired toughening of soft materials is really an exciting field.